Lamellar surgical options are replacing full-thickness grafts for many indications. 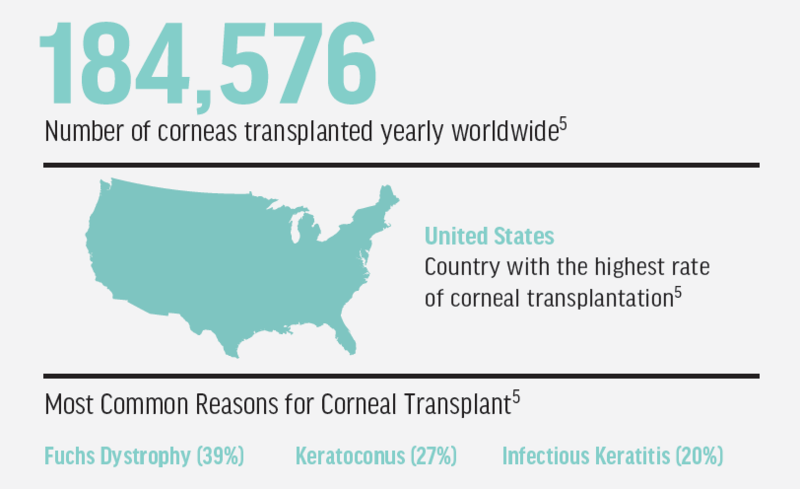 Corneal transplants are among the most successful organ transplants in the world, helping thousands of individuals each year regain usable vision. Since the first penetrating keratoplasty was performed in 1905 by Edward Zinn,1 corneal transplant techniques have evolved and improved, and a number of new transplantation options have emerged. The aim of modern corneal transplantation is to best correct the problem at hand while minimizing tissue use (Table). This article reviews some of the alphabet soup of tissue-sparing lamellar keratoplasty techniques that have emerged in recent years and outlines some of the characteristics of each. This is information that optometrists need to know for dealing with patients with issues requiring corneal surgery and for communicating effectively with surgeons. Internationally, penetrating keratoplasty (PKP) provides an integral role in restoring sight. In the United States, the penetrating technique is now generally reserved for eyes with severe keratoconus (especially in the setting of previous hydrops), full-thickness scarring, and emergency therapeutic keratoplasty in the setting of a corneal melt. Optometrists should expect patients to have a long visual recovery after PKP, often up to 1 year. Medical contact lenses will likely be necessary to achieve best visual correction, but the timing of medical contact lens fitting is dependent on suture positioning. It may be necessary to wait until sutures are removed for the best fit, but fitting can commence as soon as the swelling at the junction of the graft and host is resolved. Deep anterior lamellar keratoplasty (DALK) was described in 1999 as a technique for addressing scars and dystrophies that affect the anterior corneal stroma. With DALK, the patient’s endothelium is preserved. As a result, endothelial cell death during transplantation is reduced, and endothelial graft rejection is eliminated. Additionally, preservation of the normal host endothelial function allows postoperative swelling to improve more quickly than after PKP, and less irregular astigmatism is induced. This technique is used most commonly for keratoconus, stromal dystrophies, and any anterior scarring that has not damaged the endothelium or Descemet membrane but is too deep to be successfully addressed by phototherapeutic keratectomy. Clinically, it may initially be difficult to distinguish a DALK (Figure 1) from a PKP, as the suture appearance is similar, but careful inspection with an optic section at the slit lamp will reveal an interface that does not penetrate the entire cornea. Figure 1. 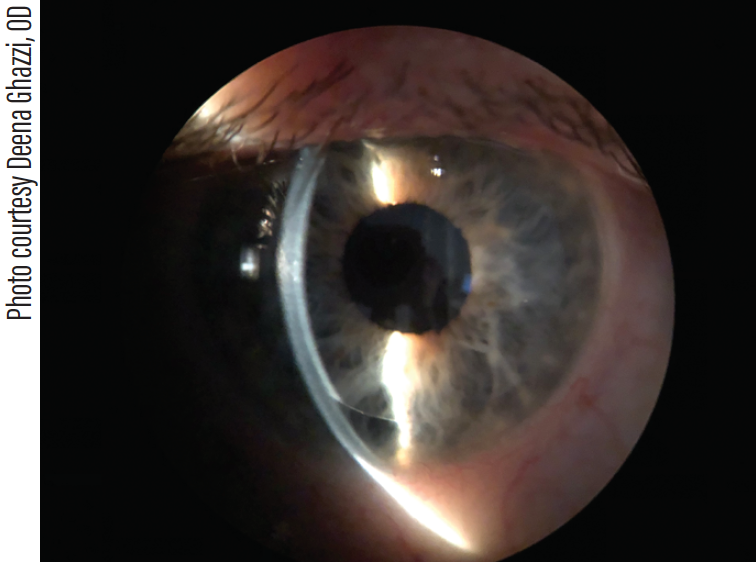 Postoperative photo of a DALK with reverse pupillary block requiring same-day revision. We can usually prepare patients to experience a speedier recovery than is true with PKP, but it is important to tell them to not be discouraged if recovery takes longer than expected. Interrupted sutures may remain for 1 to 2 years and can be selectively removed to minimize postoperative astigmatism, which improves the potential for adequate vision with spectacle correction alone. The deep lamellar endothelial keratoplasty (DLEK) technique emerged in 2000, just a year after the advent of DALK. In this technique, the patient’s anterior stroma is preserved and the posterior stroma, Descemet membrane, and endothelium are transplanted. The result is a better visual outcome, faster recovery, and better maintained integrity of the globe compared to PKP. Soon this posterior lamellar technique was refined so that only Descement membrane was stripped from the host cornea, leaving the posterior stroma intact. The resulting technique was termed Descemet-stripping endothelial keratoplasty (DSEK; Figure 2) or, if a microkeratome is used for graft preparation, Descemet-stripping automated endothelial keratoplasty (DSAEK). Most such procedures result in visual acuity of 20/50 or better and generally do not require medical lenses to achieve improved visual acuity. Figure 2. 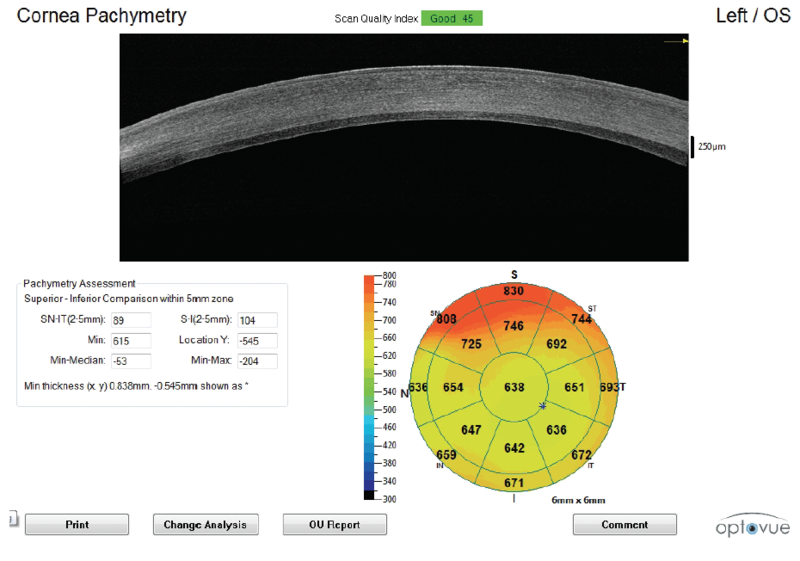 DSEK imaged using optic section to illustrate that the graft is not penetrating but replaces only the posterior third of the cornea. A final iteration of the posterior transplantation technique, Descemet membrane endothelial keratoplasty (DMEK), combined stripping the host cornea Descemet membrane, as well as stripping all posterior stroma from the donor cornea, leaving only Descemet and the endothelium intact on the donor tissue (Figure 3). The result is transplantation of an extremely thin and fragile layer of tissue, and the procedure can result in visual acuity of 20/25 or better with minimal refractive shift (Figures 4 and 5). Figure 3. Postoperative photo showing same-day DMEK (note F stamp to indicate proper orientation to the surgeon). Figure 4. Anterior segment image depicting DSEK. Note the clear, separate layer on the inside 100 μm of tissue representing transplanted endothelium and a thin layer of posterior stroma from the donor tissue. Figure 5. Anterior segment image depicting DMEK. This image is nearly indistinguishable from a normal cornea because only the endothelial layer has been transplanted without any stroma from the donor tissue. This allows a rapid visual recovery, minimal refractive shift, and less third-order aberrations. The decision of whether to use DSEK or DMEK usually depends on comorbidities such as previous glaucoma surgeries, and on the ability of the patient to lie in a face-up orientation postoperatively and to control the tendency to rub the eye. The DMEK graft takes longer to adhere, and the surgeon uses a combination of air and SF6 gas to float the graft into position, which requires 1 week of postoperative positioning. The DSEK graft attaches quickly and is floated with air alone, reducing face-up positioning time to 24 hours, which can be monitored overnight in a hospital setting. DSEK can also be secured with a safety suture in patients who are expected to have difficulty postoperatively. These patients will recover vision in 1 month or less and will usually require only an updated glasses prescription to achieve their best corrected visual acuity. The immune-privileged nature of the eye makes rejection of corneal transplants less common than with other transplanted organs, but rejection does occur (Figure 6). Frequent monitoring for early signs of rejection or neovascularization (Figure 7) is critical, as in many instances rejection can be reversed with high doses of steroids. Preferred long-term monitoring for transplant patients would be at least 3 times per year (every 4 months), and 4 times per year (every 3 months) in those with lower endothelial cell counts or previous signs of rejection. The corneal surgeon will typically see transplant patients every 6 months to check endothelial cell count with specular microscopy, and their primary eye care provider will see them once in between for their comprehensive exam. Some may be seen more frequently by their primary eye care provider if they have other ocular conditions that require monitoring such as glaucoma, but endothelial cell count, pachymetry, and slit-lamp exam should still be performed twice per year. Figure 6. Endothelial transplant rejection. Note scattered stellate keratic precipitates. This looks like and can be treated similarly to an aggressive anterior uveitis, but when caught and treated early will be less likely to deteriorate the endothelial cell count of the transplanted tissue. Figure 7. Development of neovascularization and loose suture after PKP. Suture must be removed and neovascularization managed with increased steroid therapy. Rejection or permanent reduction in vision may result. Studies suggest that prolonged prophylactic treatment with steroids (most often prednisolone acetate 1.0% or fluorometholone 0.1%) reduces the rate of rejection from 9.1% to 4.9%.2 As with any topical steroid therapy, patients treated with this regimen are at risk for steroid-induced glaucoma and must be watched for increases in IOP along with careful examination of the optic nerve. 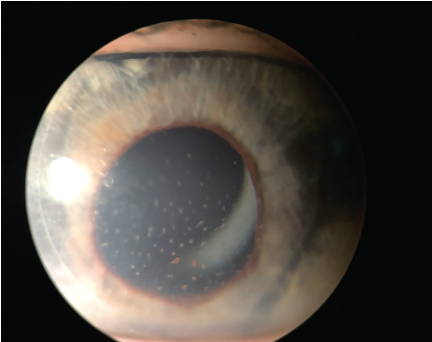 One of the goals for future advances in corneal transplant procedures will be limiting the risks of graft rejection and failure. The advent of scleral lenses has already decreased the need for DALK and PKP greatly over the past several years. 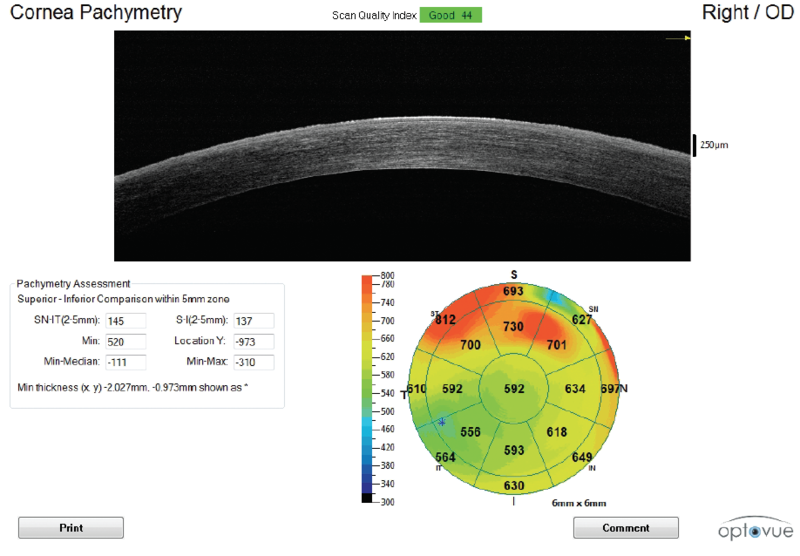 Many patients with moderate to severe keratoconus, and even patients with significant corneal scarring, can achieve adequate vision and acceptable comfort with scleral lenses. 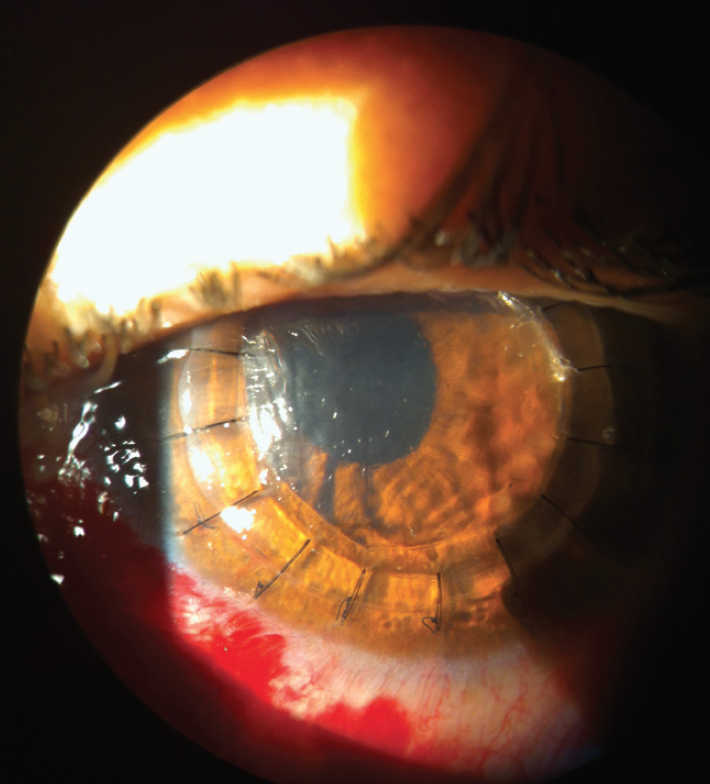 Scleral lenses should therefore at least be attempted before considering a DALK or PKP. Preventive medicine has also had an impact on the management of keratoconus. The US FDA approved corneal crosslinking (CXL) for treatment of progressive thinning and distortion of the cornea in 2016. CXL has been found to be more than 95% effective in strengthening the collagen bonds in the cornea,3 thereby stopping the progression of keratoconus. If keratoconus is identified early and treated with CXL, many patients can continue to achieve functional visual acuity with glasses alone, reducing dependence on medically necessary contact lenses or the need for a future corneal transplant. CXL has been performed on children as young as 8 years, and studies found it to be effective for at least 7 years. Unfortunately, developing ways to avoid the need for endothelial keratoplasty has proven to be more difficult. Fuchs dystrophy, damage after intraocular surgery, and other inflammatory conditions can disrupt normal endothelial function. The best chance to avoid transplant in many such cases may be through rehabilitation and the development of new endothelial cells. In recent studies in Japan, investigators used a topical rho kinase inhibitor in conjunction with stripping of Descemet membrane to induce cell regeneration and limit cell apoptosis.4 Stripping Descemet membrane without transplantation induces bullous keratopathy until the rho kinase drops begin to work. Potential innovations in this technique may therefore include injection of cultured endothelial cells or transcorneal cell regeneration (without Descemet stripping) using topical therapies. 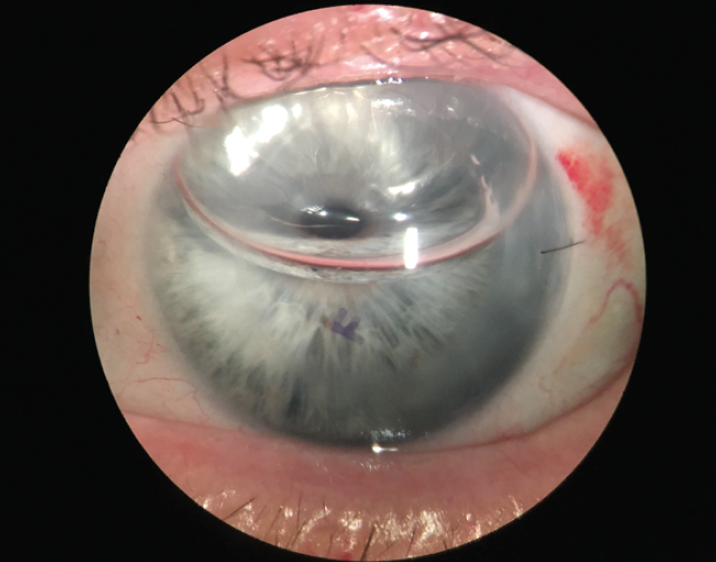 Significant advances in corneal transplantation techniques have allowed better access for patients and improved rates of success. We can now recommend these procedures to our patients with confidence that they will have better visual outcomes and less recovery time than would have been possible in the past. Innovation will be needed to further reduce or eliminate rejection and complications of corneal transplants in the future. 2. Nguyen NX, Seitz B, Martus P, Langenbucher A, Cursiefen C. Long-term topical steroid treatment improves graft survival following normal-risk penetrating keratoplasty. Am J Ophthalmol. 2007;144(2):318-319. 3. 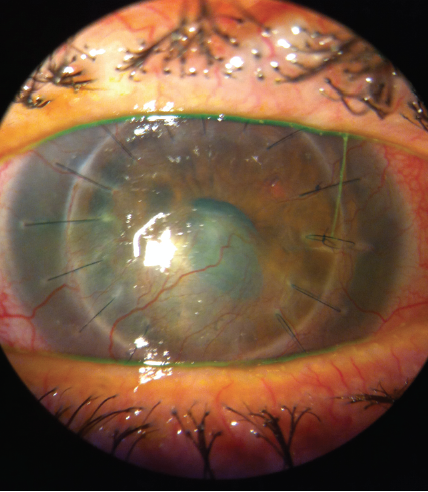 Koller T, Mrochen M, Seiler T. Complication and failure rates after corneal crosslinking. J Cataract Refract Surg. 2009;35(8):1358-1362. 4. Okumura N, Koizumi N, Kay EP, et al. The ROCK inhibitor eye drop accelerates corneal endothelium wound healing. Invest Ophthalmol Vis Sci. 2013;54(4):2493-2502. 5. Gain P, Jullienne R, He Z, et al. Global survey of corneal transplantation and eye banking. JAMA Ophthalmol. 2016;134(2):167-173. Next: What’s Your Dry Eye Acumen?